There is a huge market for reasonably priced Pinot Noir that is of very good quality. The reality is that it is expensive to farm and produce quality Pinot Noir, making value priced domestic Pinot Noir limited in availability. 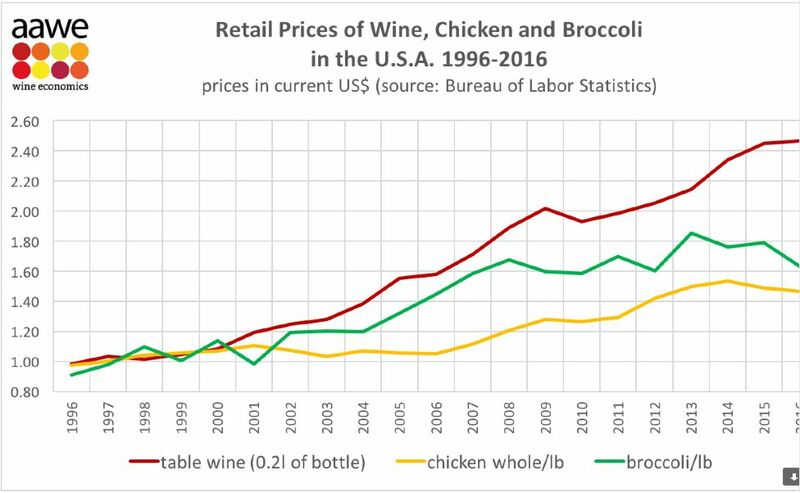 As you can see from the table below, the retail prices of table wine have escalated significantly over the past decade. Most of the wines submitted for review to the PinotFile are in the premium or ultra premium category and cost more than $40. As a result, I don’t have the opportunity to review large numbers of value priced Pinot Noir. Nevertheless, here are some recommended wines I found in 2017. I consider the value priced icon for wines that score at least 88 and are priced less than $40. A few wines were awarded both the Pinot Geek and Pinot Value icons making them particularly desirable. There was only one of these California wines reviewed in 2017 and is indicated by a preceding double asterisk. I have not included Pinot Noir Rosé wines as they almost always represent good value.